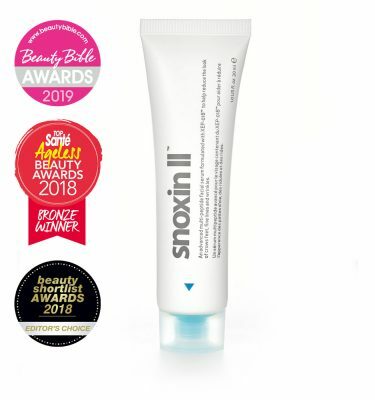 This combined serum and moisturizer is formulated with 22% L-ascorbic acid (the purest form of vitamin C) and 2% hyaluronic microspheres to help protect your skin from environmental damage, while increasing hydration levels to even out skin tone and reduce the look of fine lines and wrinkles. 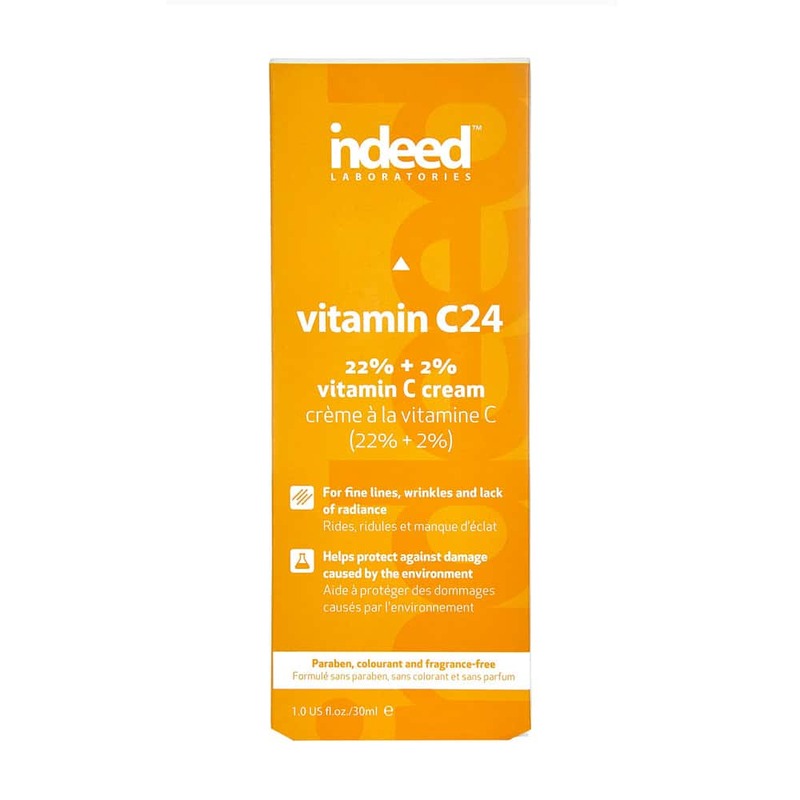 Unlike other vitamin C serums, vitamin C24 has a unique formula that stays stable, doesn’t oxidize and is designed to optimize absorption into the skin, allowing for maximum vitamin C benefits and potency. This moisturizing cream leaves your skin brighter, younger and more radiant. 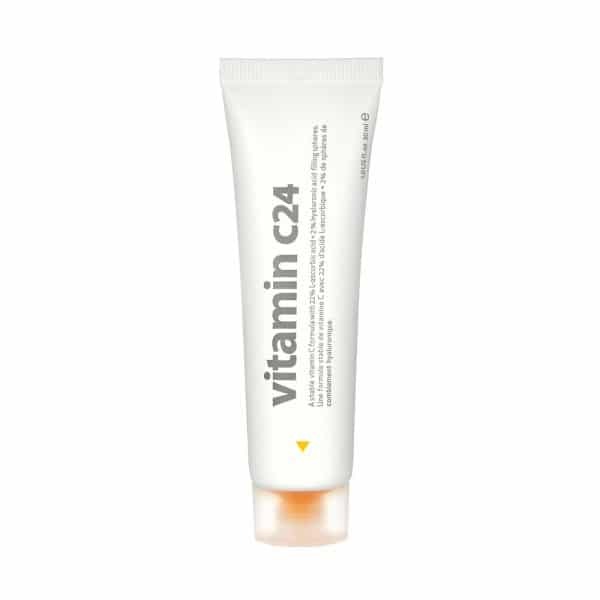 Repair, restore and protect your skin with vitamin C24; your best daily defence against environmental aggressors. Apply a pea-sized amount to a cleansed face and neck in the morning and evening. After each morning application, follow with a broad-spectrum sunscreen with SPF 30 or higher. Vitamin C: This stable and waterless formula contains 22% L-absorbic Acid, which is the purest form of vitamin C. This ingredient delivers protection against environmental aggressors like free-radicals and pollution that speed up the aging process. Microspheres of Hyaluronic Acid: The 2% hyaluronic acid microspheres maximize the absorption, stability and delivery of vitamin C while helping to retain water and moisture in the skin. Hello, I just bought a tube of C24. I also have my own hydrating serum, moisturizer cream and sunscreen. Which one do I use first after toner? Hydrating serum or C24? And follow by moisturizer? I love this product. In the beginning I thought that it was breaking me out, but it turned out to be the moisturizer I was using. Once I figured that out and my skin cleared up I had a lot of scars that needed treatment. Let me tell you, this stuff works SO fast. My scars are becoming less noticeable every day I use this and you can see results from this product almost immediately. It’s everything I could of asked for. Love love love. Really enjoying using this product. I have been using it as part of my PM routine and I love how it feels on my skin. It slightly tingles then smooths over the skin like a primer. My skin is so soft , much brighter, minimal fine lines plus the best bit I wake up with glowing skin every morning. Highly recommend this product. I love this C 24 it did brighten my complexion and I can see the hyperpigmentation is fading slowly..But I wish if you change the cream to a liquid serum in an air tight bottle without the silicon ..this would be great . Thank you for your feedback. We’re so glad that you love our Vitamin C24, thank you! In order to keep the formula stable, we use a high-quality silicone referred to as medical grade silicone since our formula is waterless. A waterless formula helps ensure the long-term stability of topical vitamin C.
This is a really great product, which really suits my oily skin. My skin became clearer a couple of weeks after I started using it (it may have been sooner as I’ve been using it for over a year now). It’s one of the indeed labs products that I ensure I never run out of. I was given this product to review and OMG blown away, so much so I want to tell you all! the first application stung a little in dry areas yet after the effects were immediate! My skin has never felt so hydrated and I’ve not had any spots around my chin area for almost 1 month now! I’m blown away by the product. Strangely this goes on a little dry, but you can apply moisturiser almost immediately without having to wait! I’m going to buy my next one and I’m so in love with my skin it’s Glowing! I’ve repurchased it at least half a dozen times now since I first discovered it last year. I need to start buying more than one at a time from now on! Specifically I have fair, sensitive skin with mild rosacea & I find your Vitamin C24 is kind on my skin yet makes a real difference to my skin clarity & really minimises the redness on my cheeks. While making my skin look fresher too! I bought this cream after reading online about other Vitamin C creams and peoples opinions on them. I did some research and came across Indeed C24. To be honest, I didn’t fully know all of the benefits of vitamin c or what it would do for me, but after a week or two, i was shocked by how improved my skin looked. I’ve been having terrible sleeps and my face was showing signs of fatigue. This cream really helped brighten and wake up my skin. I use it mostly in the morning with an spf as recommended, and sometimes use it before bed. It’s really light on the skin, which I love. 100% would recommend. Good product. Meets my expectations. Skin clearer and tighter. Would recommend. I purchased this brand based on the amount of vitamin C in this brand as compared to other brands,the reviews, and the price. All three factors made it the winner. I’m reluctant to share my secret weapon, because sometimes this product is sold out. I’ve been on the hunt for a stable vitamin C product. Not only does this product clear up red marks I’ve had for ages, but also brown sun spots. Unlike other brands it’s not abrasive, and it sometimes gives me a slight tingle but it’s not much more than when you use a good strength acid (and I’m a wimp). The secret to using it (for me) is I use it last at night. I take a pea size amount and dot over areas I want to treat and then rub it in, sometimes I’ll take a tiny bit more and pat it on certain marks I’m targeting. 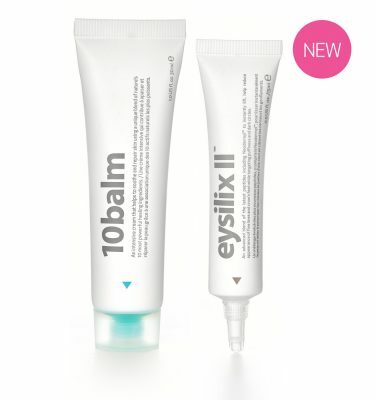 The price isn’t bad either, it’s a small tube, but I feel I’m getting a lot of use out of it.